Each year, Cass Business School sends students and staff to spend two weeks helping at Hanna's Orphanage. Head of Schools Marketing, Raffi Cuccia, speaks to City News about her experience. From the age of 14, Hanna Teshome found herself caring for orphans and the elderly in her local community in Ethiopia. By chance encounter in 2006, Jenny Higgins, a British academic, saw the wonderful work she was doing and helped her found the charity Hanna’s Orphanage. 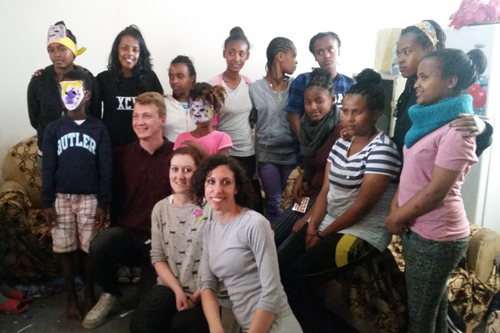 With the help of money raised in the UK, the orphanage has grown in leaps and bounds, with several sites now looking after around 400 disadvantaged children across Ethiopia. In 2009, the charity began to work with Cass Business School and since then, the two organisations have built a strong relationship. Cass has been funding volunteers each summer to travel to Ethiopia to visit the orphanage and teach at the summer school. The volunteers also get to see how the money they have raised has helped to support the development of the facilities and buy the children clothing, shoes and new classroom equipment. Over £30,000 has been raised and opportunities to help the charity are now available to many parts of City. 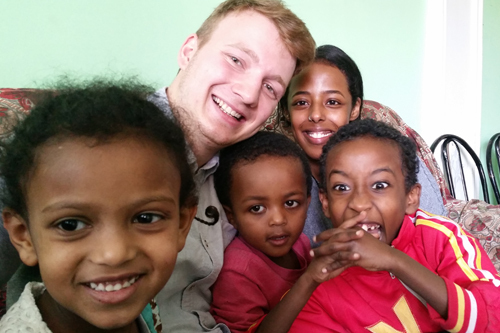 This year staff and students at Cass and the School of Health Sciences were challenged to submit a proposal for how they could raise money for Hanna's Orphanage: the entrants with the best proposals would have the opportunity to spend two weeks teaching at a branch in Addis Ababa. The volunteers’ classes complement classes taught by the Ethiopian staff at the orphanage and focus on working with the children in a visual, audio and kinaesthetic way. This year’s volunteers were Raffaella (Raffi) Cuccia, Head of Schools Marketing, who taught the children English, incorporating storytelling and dance utilising her experience as a ballerina; Sophie Roberts, MBA and MSc Rankings Manager at Cass, originally from Australia, who taught the children about native Australian animals; Nicholas Steininger, BSc Finance student, who taught the children about gravity; and Samira Fuad, BSc Optometry graduate, who used her experience in health science to educate the children on the human body. Raffi explained that volunteering at an orphanage is something she had wanted to do for a long time: “I have done a lot of volunteering here and had always wanted to go to an underdeveloped country and try and help in any way I could. Working with children is something that is especially close to my heart. Opportunities to do something like this are often fairly long-term and difficult when you have a full-time job, but when this opportunity came up, I knew I had to apply. To find out more about Hanna’s Orphanage and the work it does with Cass, visit the Hannah’s Orphanage website.